Avner Dorman is already storming the marketplace in 2018, with three commercial recordings to date in the new year. 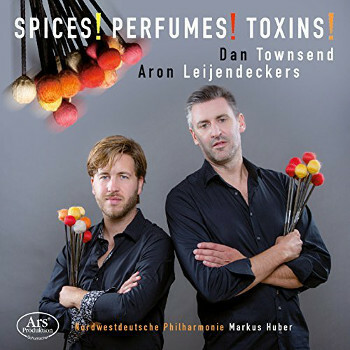 Out today on Ars Produktion is a new recording of Dorman's sensational Spices, Perfumes, Toxins!, a concerto for two percussionists and large orchestra. One of his most popular concerti to date, Spices is herein performed by the Nordwestdeutsche Philharmonie under Markus Huber, and featuring soloists Aron Jeijendeckers and Dan Townsend. The title of this composition alludes to Dorman's signature blend of danger and allure; in the words of the composer, 'Spices delight the palate, but can cause illness; perfumes seduce, but can also betray; toxins bring ecstasy, but are deadly. The concerto combines Middle-Eastern drums, orchestral percussion, and rock drums with orchestral forces — a unique sound both enticing and dangerous'. Spices also exists in versions for chamber orchestra and concert band. Also released today is the world premiere recording of Dorman's Three Etudes, performed by pianist Mackenzie Melemed. This Steinway and Sons compilation features pieces commissioned by the Stecher and Horowitz Foundation for their biannual New York International Piano Competition. On January 5th, Genuin released 'The Grand Duo', a recording of Dorman's Violin Sonata No. 2 by the intrepid violin and piano duo of So Jin Kim and David Fung, which also features the classic literature of Strauss and Schubert. Avner Dorman's online opera pilot Star Cross'd premieres via HGOco this April, and his groundbreaking first opera Wahnfried returns to Staatstheater Karlsruhe March through May, back by popular demand following its world premiere run last season.